Going from a couch potato to an adventure-seeker who sometimes gets off the couch to hike mountains, including 14ers (mountains over 14,000 feet)! Anyone brave enough to: be vulnerable, love with their whole heart, or speak out against injustice. Any anyone brave enough to rock bangs. A phone to call my family and friends for love and advice. A journal so I could record my thoughts and plot out strategy. A mirror because I'd be scared something would be in my teeth the entire time and no one would tell me. 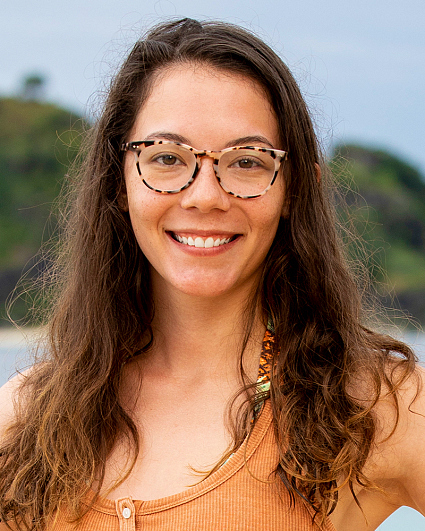 I relate to Aubry because she is both smart and emotionally intelligent. I am prone to tear-filled moments like Dawn. And I'm flirty like Parvati... if she were bad at flirting and only nerdy guys liked her. Human psychology and social dynamics fascinate me, and I'm excited to insert myself into the craziest experiment out there. I simultaneously love and hate pushing myself out of my comfort zone. I want to see if I can rise above the mental, emotional, and physical turmoil found in this game. I have the knowledge of the game, but I'm social enough to hide it and not be a (complete) dork. I'm an emotional, empathetic person who happens to have the capacity for analytical thinking. My balance between brain and heart will win me allies and a million dollars.